If you're following along on Instagram, you know yesterday I ran a few polls asking people to help me out when picking finishings for our new home that we're building. I've mentioned several times that when we remodeled our kitchen in Georgia, I wasn't obsessed with how it turned out, and so I'm all the more nervous about picking the finishings for our forever home that we're building. In theory, I felt like I did all the right things when remodeling the kitchen. I took out the linoleum and put in some dark hardwood laminate floors that we scored for free from our awesome neighbors. I took out the old light fixture and put in this amazing modern piece from Lamp's Plus, which to this day, I would make that same choice in a heartbeat. 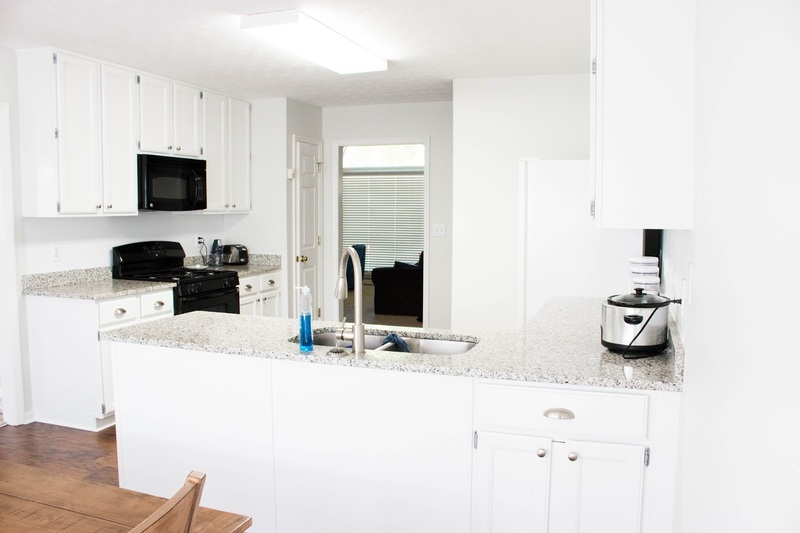 We had the maple oak cabinets painted white, added new hardware, installed granite counters, and painted the walls grey. All the pieces of the formula feel like they should yield an amazing result, but there were a few things that I just didn't love at the end to the day. The first thing I didn't love were the floors. Despite the fact that this kitchen had an entire wall of windows, because there were so many trees in our backyard, light never really came though that often. That meant that this room was fairly dark most of the time, and adding the dark floors made a dark room feel even darker. The other major issue I had was the grey paint that we chose. 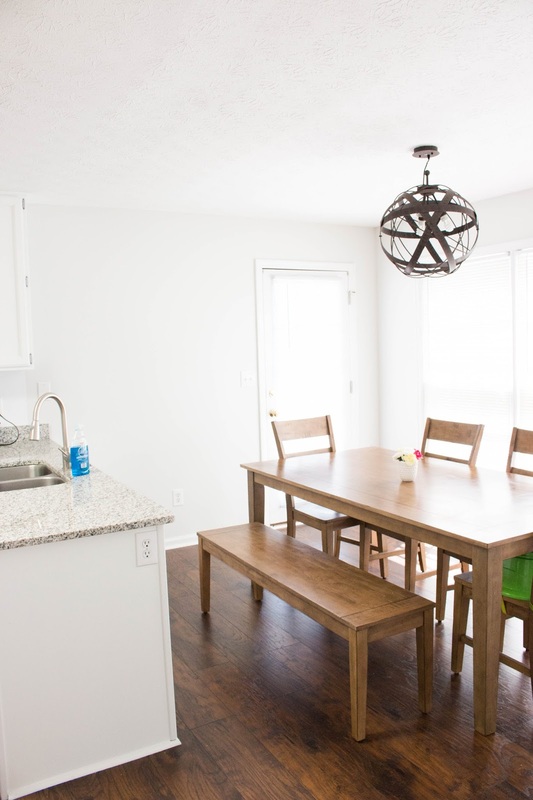 I used the same grey paint that we used in our playroom, but there was something about it in the kitchen that made it almost look white, and then it felt like it completely washed out the white cabinets and the white fridge... it felt like a white blob to be honest. We were hoping the walls would look deeper in color like they do in the playroom, but that's just not what happened in terms of the kitchen. There were things about the space that I absolutely loved. 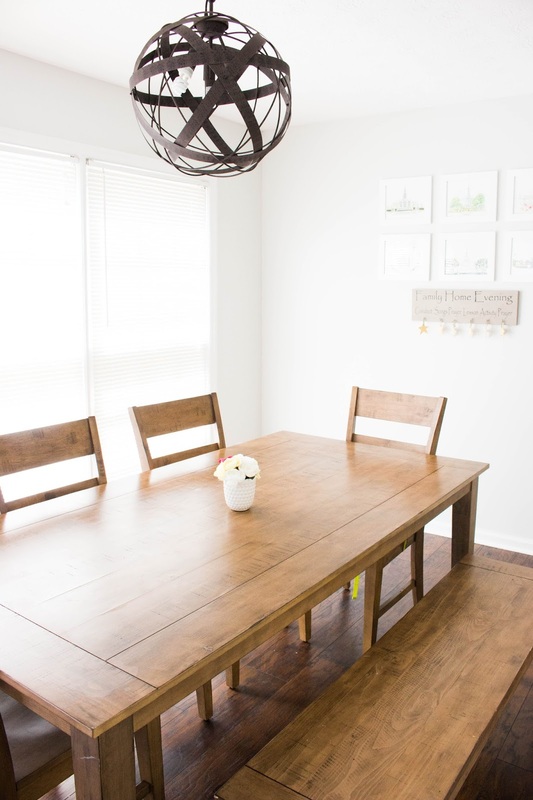 The first thing topping this list was the new light fixture that we'd gotten from Lamps Plus. I loved the look of the orbital pendant that we chose. I would put another one of these lights in our new house in a heartbeat. I really love the modern farmhouse look, and I feel like this light really brought that feel to this space. I also loved our granite countertops. I found a guy on craigslist doing counters for $25/sqft which is a total steal from most other places. I paid him upfront in cash and Derek thought I just handed a con-artist $1,200 and was convinced we were never going to see the granite in our house, but low and behold a week later, the man came through with our counters and Derek and I didn't get divorced... but I was sweating for a bit. The hardware on the cabinets was also a cheap and easy swap that made a huge difference. Previously we had black plastic knobs on all the doors and drawers. I spent about $24 at the Home Depot and was able to get round brush nickel knobs, and new drawer pulls, and it instantly brought the cabinets up to the 21st century. Overall the room did look nice in the end. Especially for the tight budget we were under. 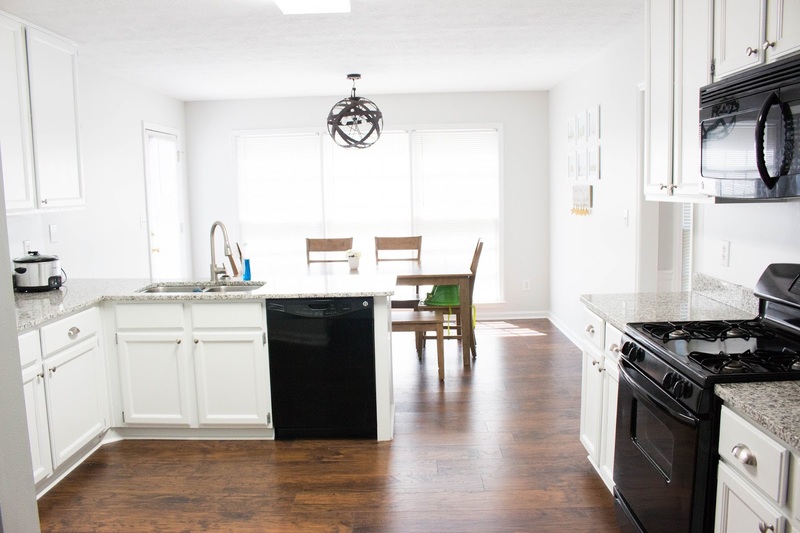 When everything was said and done we revamped this kitchen for just under $3,000. That included the paint on the walls and cabinets, new counters, new hardware, and new sink. That also included some supplies that we needed to install the new floors (the floors themselves came from our neighbors for free), we paid a handyman to come out and fix the floors that Derek messed up on twice, and Derek did all the plumbing for the new sink himself. And Lamps Plus gifted the new light to us as part of this post, that our neighbor installed for us! 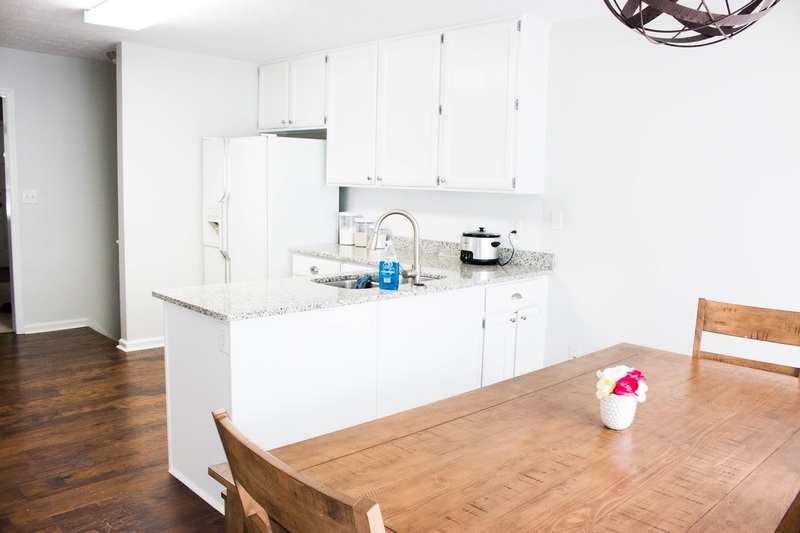 Regardless of how I actually feel about this kitchen at the end of the day, it definitely proves that you totally can give your kitchen a whole new look without breaking the bank!